Schizoaffective disorder (SAD) has features of both schizophrenia and affective disorders . Some investigations have suggested that schizoaffective disorder is a valid diagnosis that is separable from both schizophrenia and affective psychoses . However, a controversy exists concerning whether SAD is a subtype of, or an intermediate on a dimensional continuum between, schizophrenia and affective disorders, rather than a discrete entity [3,4]. Cognitive deficit is a common hallmark of all of these psychiatric disorders . Evidence suggests that cognitive profiles may provide an intermediate phenotype between behavioral manifestations and underlying neurobiological aetiology . Most of an increasing number of studies of cognitive functions in SAD have found some cognitive impairment in patients with SAD relative to controls or patients with affective disorders [6-14]. Other studies have compared the cognitive profiles of patients with SAD, patients with schizophrenia and patients with bipolar disorder (BD) . A recent review article found that neurocognitive deficits in SAD more closely resemble those in schizophrenia than those in BD . However, Van Rheenen et al. revealed that SAD is not associated with a cognitive pattern that distinguishes it from those associated with schizophrenia and BD, using a discriminant function analysis. The finding reported by Van Rheenen et al. needs further replication, because the sample size in a single study is small and evidence may be more robust in the aforementioned systematic review . Few studies have investigated cognitive deficits in SAD in non-Caucasian populations [18- 20]. Kao et al. found that age of onset on illness course significantly influence cognitive function of patients with schizophrenia spectrum disorders in Taiwan. Among patients with schizophrenia or SAD in Japan , neurocognitive performance, rather than clinical symptoms, effectively predicted patients’ employment status. Particularly, improvement in verbal working memory was regarded as the best predictor of employment outcome . However, none of the studies have investigated the differences of cognitive profiles between SAD patients and healthy individuals in non- Caucasian populations. Therefore, we hypothesize that patients with SAD exhibit worse cognitive functions than healthy individuals do, and cognitive functions in patients with SAD are associated with patients’ clinical features (e.g., SAD subtypes or psychotropic agent regimens). This study aims to look for potential differences in cognitive function between patients with SAD and healthy controls in a Chinese population. Whether cognitive impairments in patients with SAD are associated with their clinical characteristics is examined. This cross-sectional study was carried out at Chang Gung Memorial Hospital, and was approved by the Institutional Review Board. The eligibility criteria were (a) diagnosis of SAD based on the criteria in the Diagnostic and Statistical Manual of Mental Disorders, Fourth Edition (DSM-IV-TR); (b) were aged 18–65 years; (c) absence of any known systemic or neurological diseases that would affect cognitive performance; (d) Han Chinese ethnicity, and (e) ability to speak and read Chinese and to provide informed consent. A total of 45 patients with SAD were recruited from two general hospitals (Keelung Chang Gung Memorial Hospital and Kaohsiung Chang Gung Memorial Hospital). Patients were interviewed and underwent neuropsychological tests when their psychotic symptoms were relatively stable. The control group consisted of healthy staff of Kaohsiung Chang Gung Memorial Hospital staff and community volunteers in Kaohsiung City. Their recruitment criteria were (a) no history of major psychiatric disorders (such as psychosis, bipolar disorder, major depressive disorder, or organic mental disorders), systemic or neurological diseases that would affect cognitive performance; (b) were aged 18–65 years; (c) Han Chinese ethnicity, and (d) ability to speak and read Chinese and to provide informed consent. A total of 89 healthy controls were thus recruited. The cognitive functions of all participants were assessed using the Brief Assessment of Cognition in Schizophrenia (BACS) . BACS is a battery of tests that measures the cognition functions that are most impaired in patients with schizophrenia . BACS takes around 30 minutes, has a high completion rate, and has high test–retest reliability . The BACS battery has served as a neuropsychological assessment scheme across patients with various psychotic disorders . The BACS tests include the List Learning Test, the Digit Sequencing Task, the Token Motor Task, the Category Instances Test, the Controlled Oral Word Association Test, Symbol Coding, and the Tower of London Test, which evaluate verbal memory, working memory, motor speed, verbal fluency, attention, and processing speed, and executive function, respectively. The primary measure in each BACS domain is standardized using T- or Z-scores. Finally, a composite score is obtained by comparing each patient’s performance on each measure with the corresponding performance of a healthy comparison group . The T-score for each scale was used in the analysis herein. A T-score of 50 on each scale indicates average functioning for the normal population of the same age range and gender, and every 10 points represents one standard deviation (SD). The clinical psychopathology of patients with SAD was assessed using the Brief Psychiatric Rating Scale (BPRS) . The 18-item BPRS has been extensively used in both clinical and pharmaceutical research to assess general psychopathology and is a valid inventory for patients with psychosis. All items were scored on a seven-point Likert-scale, and higher scores indicated greater severity. The measures scores were calculated using small sets of variables, including positive symptoms, negative symptoms and general psychopathological symptoms . Age of onset, usage of antipsychotic drugs, mood stabilizer usage (lithium, valproic acid or carbamazepine), antidepressants and benzodiazepines were determined through interview, with reference to the patients’ medical records. Because of the small sample sizes, the users of lithium, valproic acid or carbamazepine were combined into a single group for analysis. Data were analyzed using the statistical software package SPSS (Version 21.0; SPSS Inc., Chicago, IL, USA). The variables were presented as either mean (±SD) or frequency (%). In a two-tailed test, P<.05 was regard as indicating statistically significance. Values of categorical variables of SAD patients and healthy controls were compared using the Chi-Square test or Fisher’s exact test; the t-test was used to compare the values of continuous variables between groups. Receiver Operating Characteristic (ROC) analyses and Area under Curve (AUC) were further used to determine the validity of using the T-score in each BACS subtest to distinguish patients with SAD from healthy controls. Multivariate analysis of covariance (MANCOVA) was applied to examine the difference of each neurocognitive domain of the BACS between patients with SAD and healthy controls, controlling for age, gender and education level. Additionally, MANCOVA was also used to evaluate the effects of clinical features on each neurocognitive domain of the BACS. The T-scores from the six subtests and the composite BACS score were the dependent variables. To reduce type I errors, Bonferronicorrected post hoc tests were performed using the MANCOVA model. Table 1 presents the relevant characteristics of 45 patients with SAD and 89 healthy controls. No significant difference between the participants’ age was observed. Relative to the control group, the SAD group included proportionally more females (P =.043), more unmarried persons (P<.001), more unemployed persons (P<.001), and persons with a lower level of education (P=.003). Compared with the control group, all members of the SAD group were impaired in all of the dimensions of cognitive function that are assessed using the BACS (P<.001). Table 1: Characteristics of patients with schizoaffective disorder (SAD) and healthy control subjects. The ROC analysis (Figure 1) revealed that all BACS subtest scores significantly differentiated patients with SAD from healthy controls (P<.001). The attention and processing speed scores had the best discriminant validity (AUC: 0.89), followed by the BACS composite score (AUC: 0.88), and the motor speed (AUC: 0.85), verbal memory (AUC: 0.83), working memory (AUC: 0.81), executive function (AUC: 0.76), and verbal fluency (AUC: 0.75) scores (Table 2). After controlling for age, gender and education level, patients with SAD still performed worse in each neurocognitive domain of the BACS than healthy controls did (Table 2). Figure 1: The Receiver Operating Characteristic analysis for subtests of the BACS in discriminating patients with schizoaffective disorder and healthy controls. Table 2: The discrimination validity of cognitive performance in patients with schizoaffective disorder and healthy controls, using the receiver operating characteristic (ROC) analyses and the multivariate analysis of covariance (MANCOVA). Table 3 presents the relationship between clinical features and each BACS subtest scores for patients with SAD. Patients’ education levels were positively correlated with working memory performance (P<.001), verbal fluency (P=.013), attention and processing speed (P=.012), executive function (P=.001) and the composite score (P=.001). Bipolar type SAD patients exhibited worse working memory (P=.046) than depressive type SAD patients. Patients who were being treated with a mood stabilizer performed worse in executive function (P=.046). Table 3: Relationships of clinical features and each cognitive domain measured by the BACS among patients with schizoaffective disorder (SAD). The results in this study demonstrate that patients with SAD exhibit significant deficits in all cognitive domains that are measured by BACS, relative to healthy control subjects. Among all tested cognitive functions, attention and processing speed had the greatest discriminant validity for differentiating SAD patients from healthy individuals. Moreover, bipolar type SAD patients performed worse in working memory, and treatment with a mood stabilizer was associated with poor executive function. An increasing number of studies are reporting that patients with SAD are impaired in a wide range of cognitive functions, including working memory, executive function, sustain attention and verbal memory [6-14]. The findings in our study are consistent with those of previous studies, and we suggest that patients with SAD have many deficits in a broad range of neurocognitive functions. Neurocognitive deficits in SAD patients can critically affect their social adaptation and occupational functions . However, most relevant previous studies involved patients with schizophrenia or BD and examined neurocognition across various psychotic disorders. Therefore, future research that involves patients with various psychotic disorders will be helpful for elucidating the neurocognitive characteristics of non-Caucasian population. SAD patients herein exhibited obvious deficits in attention and processing speed, relative to healthy control subjects. 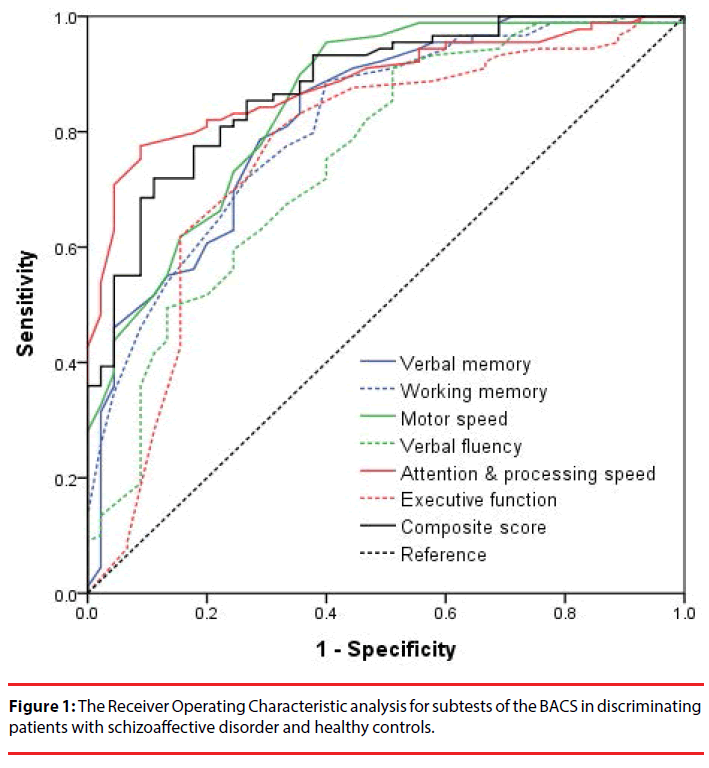 ROC analyses (Figure 1 and Table 2) revealed that the use of attention and processing speed to discriminate between SAD patients and controls was more valid than the use of BACS composite scores which consider) overall cognitive performance). One study found that attentional abilities have potential in differentiating between patients with SAD and healthy control subjects . In patients with schizophrenia, early sensory processing deficits have been associated with attention impairment . Dopaminergic modulation by D1 receptor activation affected attention function, and the underlying mechanism of this effect has been investigated. Hypodopaminergic modulation and reduced N-methyl-d-aspartate (NMDA) conductance weaken the attention attentiveness . Whether the neurobiological mechanisms that underlie attention deficit in patients with schizophrenia do so in patients with SAD warrants further investigation. In this study, bipolar type SAD patients exhibited worse performance in working memory than their counterparts with depressive type SAD patients. Patients who were treated with a mood stabilizer performed worse in executive function. To the best of our knowledge, this study is the first to identify differential cognitive function between SAD subtypes. In bipolar type SAD patients, evidence supports the use of an atypical antipsychotic and a mood stabilizer or atypical antipsychotic monotherapy. In depressive-type SAD patients, the combination of an atypical antipsychotic and an antidepressant is probably the preferred treatment, but an atypical antipsychotic and a mood stabilizer may also be used . Lithium treatment appears to have only a few, and minor negative effects on cognition . Valproic acid may impair spatial working memory, perhaps by reducing neurogenesis within the hippocampus . Notably, patients with bipolar type SAD are typically treated with antipsychotics and a mood stabilizer, and the number of patients with depressive type SAD in this study was small (n=7). The small sample size limited the statistical power. Furthermore, the effect of the mood stabilizer on executive function only showed marginally statistical significance (P=.046), and the specific effect of each mood stabilizer (e.g., lithium, valproic acid or carbamazepine) remains undetermined. Ongoing longitudinal studies with a larger sample size must be carried out to elucidate the relationship between SAD type, mood stabilizer usage and cognitional decline. This study has certain limitations. First, it used a cross-sectional design. Whether the degree of cognitive deficit reflected patients’ premorbid function (i.e., premorbid intelligence quotient), alteration during the course of SAD or the effects of pharmacotherapy could not be determined. Second, the size of SAD group was small. The small sample size reduced the statistical power to identify a correlation between clinical manifestations (psychotic symptoms) and neurocognitive function. Third, this study lacked patients with schizophrenia and BD for comparison. Whether the particular attention deficit is specific to SAD patients is uncertain. Fourth, the patients with SAD and the healthy controls were not accurately in terms of demographic characteristics. For example, the SAD group comprised mostly females, and had lower education levels than healthy controls. Additionally, various important factors that are potentially associated with cognitive function (such as severity of mood symptoms, duration of illness, patterns or doses of antipsychotics, and experience of hospitalization) were not clearly identified or considered in the analysis. Finally, SAD patients were diagnosed on the DSM-IV criteria. The DSM-5 states that a SAD diagnosis can be made only if full mood disorder episodes have been present for most of the total active and residual course of the illness, from the onset of psychotic symptoms until the current diagnosis [34,35]. Whether the findings in this study can be applied to patients who have been diagnosed SAD based on DSM-5 remains unclear. In summary, a comparison with healthy control subjects revealed that patients with SAD exhibit significant deficits in all cognitive domains that are measured using BACS, and particularly in attention and processing speed. Whether the obvious deficits of attention and processing speed are specific to SAD requires confirmation by comparison of cognitive profiles with those of patients with other psychotic disorders. This study was funded by a grant (MOST103- 2314-B-182-011-MY3) from the Ministry Of Science and Technology, Taiwan and grants from Chang Gung Memorial Hospital, Taiwan (CMRPG8C1051, CMRPG8C1291 and CMRPG8E1351). The sources of funding were not involved in the design of the study, the collection, analysis and interpretation of data, the writing of the report, or the decision to submit the article for publication. Kotov R, Leong SH, Mojtabai R, et al.Boundaries of schizoaffective disorder: revisiting Kraepelin. JAMA. Psychiatry70(12), 1276-1286 (2013). Kendler KS, McGuire M, Gruenberg AM, et al.Examining the validity of DSM-III-R schizoaffective disorder and its putative subtypes in the Roscommon Family Study. Am. J. Psychiatry152(5), 755-764 (1995). Pagel T, Baldessarini RJ, Franklin J, et al.Heterogeneity of schizoaffective disorder compared with schizophrenia and bipolar disorder. Acta.Psychiatr.Scand128(4), 238-250 (2013). Santelmann H, Franklin J, Busshoff J, et al.Diagnostic shift in patients diagnosed with schizoaffective disorder: a systematic review and meta-analysis of rediagnosis studies. Bipolar.Disord18(3), 233-246 (2016). Barch DM, Sheffield JM. Cognitive impairments in psychotic disorders: common mechanisms and measurement. World. Psychiatry13(3), 224-232 (2014). Hill SK, Reilly JL, Keefe RS, et al.Neuropsychological impairments in schizophrenia and psychotic bipolar disorder: findings from the Bipolar-Schizophrenia Network on Intermediate Phenotypes (B-SNIP) study. Am. J. Psychiatry170(11), 1275-1284 (2013). Torniainen M, Suvisaari J, Partonen T, et al.Cognitive impairments in schizophrenia and schizoaffective disorder: relationship with clinical characteristics. J.Nerv.Ment. Dis200(4), 316-322 (2012). Amann B, Gomar JJ, Ortiz-Gil J, et al.Executive dysfunction and memory impairment in schizoaffective disorder: a comparison with bipolar disorder, schizophrenia and healthy controls. Psychol. Med42(10), 2127-2135 (2012). Gooding DC, Tallent KA. Spatial working memory performance in patients with schizoaffective psychosis versus schizophrenia: a tale of two disorders? Schizophr. Res53(3), 209-218 (2002). Roofeh D, Cottone J, Burdick KE, et al. Deficits in memory strategy use are related to verbal memory impairments in adolescents with schizophrenia-spectrum disorders. Schizophr. Res85(1-3), 201-212 (2006). Torrent C, Martinez-Aran A, Amann B, et al. Cognitive impairment in schizoaffective disorder: a comparison with non-psychotic bipolar and healthy subjects. Acta.Psychiatr.Scand116(6), 453-460 (2007). Heinrichs RW, Ammari N, McDermidVaz S, et al.Are schizophrenia and schizoaffective disorder neuropsychologically distinguishable? Schizophr. Res99(1-3), 149-154 (2008). Madre M, Radua J, Landin-Romero R, et al.Trait or state? A longitudinal neuropsychological evaluation and fMRI study in schizoaffective disorder. Schizophr. Res159(2-3), 458-464 (2014). Fleck DE, DelBello MP, Zimmerman ME, et al.Selective attention in schizoaffective disorder: pilot data. Schizophr. Res68(1), 109-110 (2004). Rink L, Pagel T, Franklin J, Baethge C. Characteristics and heterogeneity of schizoaffective disorder compared with unipolar depression and schizophrenia - a systematic literature review and meta-analysis. J. Affect.Disord191(1), 8-14 (2016). Madre M, Canales-Rodriguez EJ, Ortiz-Gil J, et al.Neuropsychological and neuroimaging underpinnings of schizoaffective disorder: a systematic review. Acta.Psychiatr.Scand134(1),16-30 (2016). Van Rheenen TE, Bryce S, Tan EJ, et al.Does cognitive performance map to categorical diagnoses of schizophrenia, schizoaffective disorder and bipolar disorder? A discriminant functions analysis. J. Affect.Disord192(1), 109-115 (2016). Kao YC, Liu YP. Effects of age of onset on clinical characteristics in schizophrenia spectrum disorders. BMC. Psychiatry10(1), 63 (2010). Kaneda Y, Jayathilak K, Meltzer HY. Determinants of work outcome in schizophrenia and schizoaffective disorder: role of cognitive function. Psychiatry. Res169(2), 178-179 (2009). Kaneda Y, Jayathilak K, Meltzer H. Determinants of work outcome in neuroleptic-resistant schizophrenia and schizoaffective disorder: cognitive impairment and clozapine treatment. Psychiatry. Res178(1), 57-62 (2010). Keefe RS, Goldberg TE, Harvey PD, et al.The Brief Assessment of Cognition in Schizophrenia: reliability, sensitivity, and comparison with a standard neurocognitive battery. Schizophr. Res68(2-3), 283-297 (2004). Keefe RS, Poe M, Walker TM, et al.The Schizophrenia Cognition Rating Scale: an interview-based assessment and its relationship to cognition, real-world functioning, and functional capacity. Am. J. Psychiatry 163(3), 426-432 (2006). Wang LJ, Lin PY, Lee Y, et al.Validation of the Chinese Version of Brief Assessment of Cognition in Schizophrenia (BACS). Neuropsychiatric Disease and Treatment, In Press (2016). Hochberger WC, Hill SK, Nelson CL, et al.Unitary construct of generalized cognitive ability underlying BACS performance across psychotic disorders and in their first-degree relatives.Schizophr. Res170(1), 156-161 (2016). Keefe RS, Harvey PD, Goldberg TE, et al. Norms and standardization of the Brief Assessment of Cognition in Schizophrenia (BACS). Schizophr. Res102(1-3), 108-115 (2008). Flemenbaum A, Zimmermann RL. Inter- and intra-rater reliability of the Brief Psychiatric Rating Scale. Psychol. Rep32(3), 783-792 (1973). Sawamura J, Morishita S, Ishigooka J. Is there a linear relationship between the Brief Psychiatric Rating Scale and the Clinical Global Impression-Schizophrenia scale? A retrospective analysis. BMC. Psychiatry 10(1), 105 (2010). Hofer A, Rettenbacher MA, Widschwendter CG, et al.Correlates of subjective and functional outcomes in outpatient clinic attendees with schizophrenia and schizoaffective disorder. Eur. Arch. Psychiatry. Clin.Neurosci256(4), 246-255 (2006). Smucny J, Olincy A, Eichman LC, et al.Early sensory processing deficits predict sensitivity to distraction in schizophrenia. Schizophr. Res147(1), 196-200 (2013). Okimura T, Tanaka S, Maeda T, et al.Simulation of the capacity and precision of working memory in the hypodopaminergic state: Relevance to schizophrenia. Neuroscience295, 80-89 (2015). Vieta E. Developing an individualized treatment plan for patients with schizoaffective disorder: from pharmacotherapy to psychoeducation. J. Clin. Psychiatry71(2), 14-19 (2010). Umka J, Mustafa S, ElBeltagy M, et al. Valproic acid reduces spatial working memory and cell proliferation in the hippocampus. Neuroscience 166(1), 15-22 (2010). Malaspina D, Owen MJ, Heckers S, et al.Schizoaffective Disorder in the DSM-5. Schizophr. Res150(1), 21-25 (2013). Esan O. DSM-5 schizoaffective disorder: will clinical utility be enhanced? Soc. Psychiatry. Psychiatr. Epidemiol50(3), 501-502 (2015).